The nine cannabis-related measures on ballots across the nation have drawn immense attention, most notably in the form of tens of millions of dollars in political contributions. Campaign finance data shows that 20 businesses and individuals account for a whopping $20.8 million in donations on both sides. Of that total, $13.7 million has come from 10 individuals and more than $7 million from 10 businesses. Financial support has come hot and heavy on both sides of the legalization debate. All told, billionaire Sean Parker has donated $9 million to California’s Proposition 64, which would legalize recreational cannabis if it passes. Of that total, $1.5 million has come out of Parker’s pocket in support of the measure; he has spent an additional $7.5 million through committees and other channels (the latter number is not reflected in the accompanying chart). Meanwhile, anti-marijuana casino mogul Sheldon Adelson has spent $5 million of his own money spread among four state campaigns trying to defeat ballot initiatives aimed at legalizing both adult-use and medical marijuana. Adelson has contributed $1.5 million to defeating medical marijuana legalization in Florida, $1 million to a campaign opposing recreational cannabis in Massachusetts, $2 million toward the defeat of adult-use in Nevada and $500,000 to a group opposing rec in Arizona. According to a review of campaign finance records by Marijuana Business Daily, other top benefactors include both individuals and businesses that are directly tied to the cannabis trade as well as those that have no direct connection to the industry. Daniel Lewis, who is related to former Progressive Insurance chairman and big-time legalization supporter Peter Lewis, has given $1.25 million to help pass the measure. Henry van Ameringen, a New York philanthropist and billionaire, also has contributed $1.25 million to Prop 64. Nicholas Pritzker, a former CEO and chairman of the Hyatt Corp., has donated $500,000 to support the initiative. Businesses from within the marijuana industry and outside of it have also gotten involved in California. Ghost Management Group, an MJ-focused venture capital firm and owner of Weedmaps, has contributed $1 million and also has given $50,000 to support rec legalization in Nevada. And Dr. Bronner’s Magic Soaps, a manufacturer of organic personal care products, has contributed $250,000 to back Prop 64. However, political opponents of Prop 64 in California have wealthy supporters of their own, including millionaire and retired art professor Julie Schauer, who has donated $1.364 million to defeat the initiative. That accounts for 85% of all donations to anti-rec groups in California. Schauer also had contributed $30,000 to opponents of the Nevada adult-use initiative. 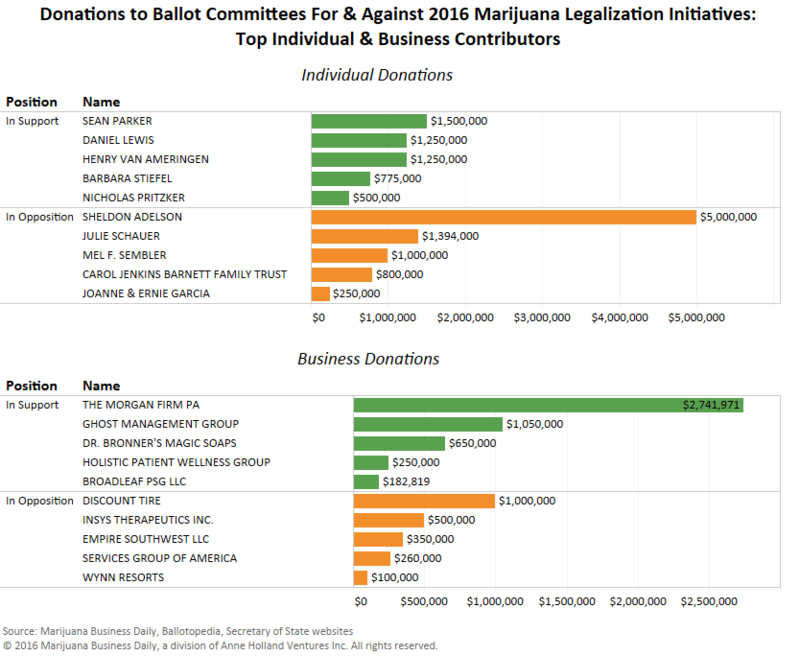 In Florida, another closely watched cannabis campaign, the biggest donors on both sides include attorney John Morgan – whose law firm has given more than $2.7 million to support medical cannabis – and Mel Sembler, who has put in $1 million to defeat medical marijuana. Barbara Stiefel, a member of the billionaire Stiefel family, has given $775,000 to support Florida’s MMJ campaign. Carol Jenkins, a daughter of Publix Super Markets founder George Jenkins, donated $800,000 toward defeating the proposal through the Carol Jenkins Family Trust. The biggest donation from an Arizona business has been $1 million from Scottsdale-based Discount Tire. Insys Therapeutics, the developer of the opiate-based painkiller Fentanyl, donated $500,000. The third-largest business donor is Empire Southwest, a heavy-machinery company that has contributed $350,000 to fight rec legalization. Services Group of America, a holding company with several subsidiaries in the food service industry, has donated $260,000. Businesses supporting the Arizona rec campaign haven’t been as charitable, but there still have been several major contributions. Those include $250,000 from Arizona MMJ dispensary Holistic Patient Wellness Group and $400,000 from Dr. Bronner’s Magic Soaps. Other statewide campaigns haven’t drawn nearly as much interest from wealthy individuals and businesses, but there are still some noteworthy contributions from both marijuana supporters and opponents. Broadleaf PSG, for example, has donated $182,819 to support Issue 6, which would legalize medical cannabis in Arkansas. The Ohio-based company is backed by Cheney Pruett, CEO of DMP Investments of Texarkana, Texas. And Wynn Resorts, a resort and casino company, has contributed $100,000 to fight adult-use legalization in Massachusetts. companies, so we as consumers can vote with our dollars? I for one will never stay at a Wynn property or buy tires from Discount. I also used to like Papa Johns, but that CEO’s comments on the 2013 election cured me for good! Yep! Those boys are toast. Not spending nothing at those venders. Screw them! a list of anti marijuana donors would be great. I vote with my $$$$$ as often as I can. if a list is made available thousands of other consumers can make informed choice where to spend their $$$.